Winding through the streets of Seoul, if it weren’t for the film cameras, Jason Hoffman in many ways would be much like any other American tourist discovering a country completely foreign to him; trying new foods, hitting the major tourist sites, posing for photographs, stumbling with the language. But Jason is far from being an ordinary tourist; this is not a holiday and this is not his first time in Seoul. When asked about the title, Going Home, Jason chuckles and admits to AJL that after he and Mikyung submitted their proposal they were told they had to come up with a title for their fledgling idea. Pressured to come up with a title on the spot before the project even took shape, Jason suggests that it was somewhat of an arbitrary selection. But, in the end, the title truly defines his journey to find his birth mother. Jason begins his search for his roots with first consulting his parents (that is, his adoptive parents). The scene in the film is touching and defines this relationship between parents and child. He is able to have a very open and honest dialogue with them about his desire to locate his birth-mother without fear and apprehension. He explains that he has concerns that this decision would hurt them and has to carefully weigh the benefits and the potential harm it might cause them. Despite his initial apprehension, they were warm, open and accepting and told him it was a decision that he alone could make. Jason explains that his parents were always very open with him about his adoption, he laughs and adds it is a fact that is difficult to ignore given his Asian face. The Hoffmans created a family ritual to mark Jason’s adoption day. The family would make their way to K-Town (the local name for the Korean section of New York City) and sample traditional foods. They participated in the annual Korean Day Parade in New York City and proudly dressed Jason in the bright, traditional clothing of his birthplace. Together they marched as a family to celebrate their connection to Korea. Jason explains that their decision to adopt from Korea in the first place was a practical one as Korea was known at the time as a fairly easy place, politically speaking relative to other Asian countries, to secure a foreign adoption. He also explains that they had joined a group called AKA (Also Known As) to guide them through various stages of the adoption process and many of the other families in the group had also looked toward Korea. As for his Jewish education, Jason explains that at 8, he was given the choice to attend either Korean School or Hebrew School. Jason again laughs and tells AJL, “I chose Hebrew School. All of my friends were going.” He recalls being the only Asian face in his Hebrew School, but in the liberal, Reformed environment he grew up in, he was not conscious of this difference. He describes himself as not religious and secular, yet purposefully he includes a clip from his Bar Mitzvah in the film, the only clip from his childhood. Jason explains this by offering his understanding of the significance of a Bar Mitzvah in Judaism to define the individual and to solidify their connection with the community. He explains that for him it was truly was a turning point of self-realization and an event that took on an additional layer of importance. When his Bar Mitzvah invitations went out to his friends from public school, he explains that people were shocked. They laughed. He was asked by friend if this was a joke. To those 13 year olds, they were only able to see an Asian face. He was just beginning to feel a pull between his two seemingly conflicting identities as a Jew and a Korean. For that day, however, in that moment, questions about his identity disappeared. 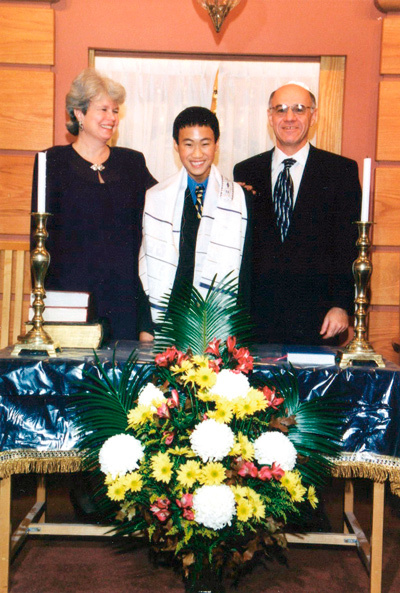 His Bar Mitzvah, he explains, cemented his personal identity as a Jew. He knew his place. It was a moment of clarity and a celebration of being at home in a community. Jason explains that now he strongly indentifies as Jewish based on cultural ties and his value system. This is not in any way a result of being adopted in but a result of how he was raised, his parents own brand of Judaism in a secular, liberal, cosmopolitan New York City in the 1980s. Forming a dramatic contrast to the Bar Mitzvah scene, is a later scene in the film when Jason and Mikyung visit a Korean Temple in Seoul. For Jason, surrounded by white lanterns in a place of worship so unfamiliar to his own, the emotions were intense. Reaching that moment was a long journey. When he bought his plane ticket to Seoul, he explains that he was absolutely prepared that he might turn around empty handed without any information about his past. He says that he was completely prepared for the visit to Seoul to not go well, unsure if he would find his mother and if she wanted to be found. He jokingly adds, though, that without an ultimate meeting, this would have been a very short film. He roams the city hoping to connect with this culture that is so foreign to him while trying to continue to remain strong enough for the emotional reality and challenges that await him. As a New Yorker, he explains that he connected with the energy of the city. While he talks about a real feeling a familiarity, he also admits that it might have been a result of the pressure to forge a connection. Ultimately, Jason meets with both his birthmother and biological sister. His sister never knew of his existence, yet the two immediately connect. He explains that this may be in part due to the fact that they both grew up as only children and they have no context for their relationship. The reunion with his birth-mother seems a bit more constrained and reserved. Her face is not shown. Jason explains that this was done out of a cultural sensitivity and a recognition of the need to protect her identity and shield her from any shame she might be made to feel. To support their son, Jason’s parents also journey to Seoul. 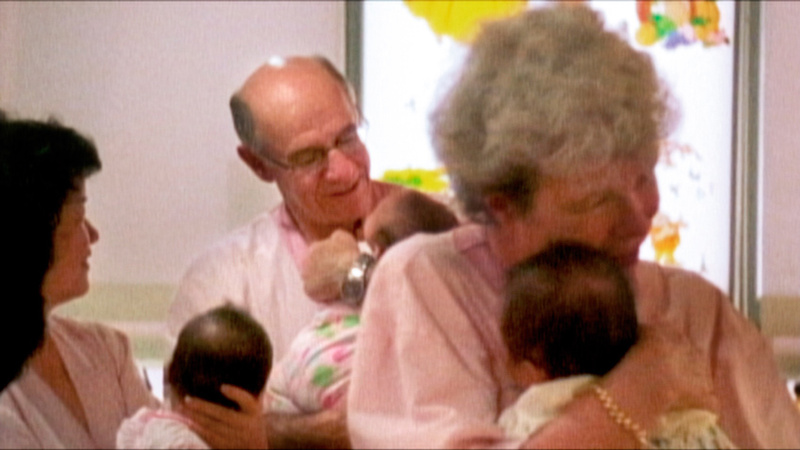 Together they visit an orphanage and his parents hold babies metaphorically completing Jason’s journey. As he ultimately learns, while his Korean identity and his biological sister and mother are integral parts of him, he didn’t need to journey to find home. He adds that the nonlinear structure of the film forced him to step back to achieve this clarity. It is then, in the review process, that he understood how much meaning was attached to the film’s title. With respect to the aftermath, when the cameras were no longer rolling, Jason explains to AJL that the film, “in many ways has brought me even closer to my parents. We talk frequently and very openly about adoption and feelings. I was raised as their flesh and blood. That is real.” He heavily relied on the support of his parents and their guidance. Off-screen, he continues to have a relationship with his biological sister but does find language to be a barrier. In the film the two pledge to learn each other’s languages. When asked how his Korean is coming, Jason confesses it’s not great, but he is very clear about his love for his biological sister. He wants her to come to the United States to visit along with his biological mother, though a visit from his birth-mother he admits is highly unlikely. As far the perspective he gained, he is clear about the centrality of family in his life and to the Judaic tradition in general. This is something, coupled with the role of ritual and tradition, he finds to be a similarity with Korean culture. This brand of Judaism, built on family tradition and culture, is something he has proudly shared with his Korean girlfriend and fellow filmmaker, Mikyung. She has celebrated Hanukah and Passover with the Hoffman family. Though Jason has never been to Israel, he says he would very much like to go and said he has been toying with the idea of participating in a Birthright Tour. Maybe he will discover that Israel is in fact home; or perhaps he really has found it in the West Village of New York City. Jason hopes that people understand his film to be a “celebration of adoption and ultimately about family and about my journey. Adoptions can be wonderfully successful and beautiful.” In Going Home, he simply rediscovered his place in the world through new lenses, comfortable in his own skin of complex layers. He says he identifies himself as an American, first and foremost, a filmmaker second and Jewish and Korean in equal part. As for the future, he says should he have children of his own, either biological or adopted, he plans to give them the opportunity to discover both their Jewish and Korean roots. They too will have a place to go home.